When one has a passion, an unswerving emotional connection to a cause, the focus can be as fine as sunlight through a lens. 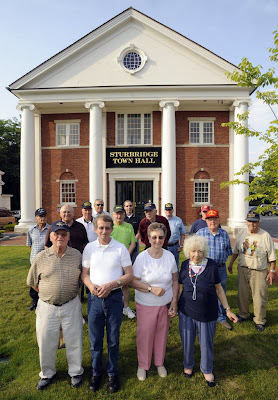 Recently, here in Sturbridge, the passion, and focus of our veterans, and residents, was unrelenting, and it paid off. That intense attention paid to a cause can be be hard to deny. On Tuesday evening, the selectman voted 4-1 to restore the Veterans Monument that had stood outside of the Town Hall for years until it was dismantled during the recent restoration of the Town Hall. The bronze plaques were then moved inside of the hall, and placed on the wall of the second floor, out of sight of all those except those that happened upon them in that out of the way place. This did not settle to well with those that have family, and friends on the plaques, and above all, to those actual veterans whose names were on the plaques. They felt slighted, hurt, and as if they had been put away on a shelf. Honoring those that have served is a public honor, a full time, twenty four hour a day honor, and not something that is turned off when the Town Hall is closed for the night, or weekend, and restored on Monday morning. Some feel that the plaques should remain in the Veterans Memorial Hall in the Town Hall, and there may lie part of the problem. A "memorial" is associated with those that have passed, or a past event. It is the difference between Memorial Day, and Veterans Day. Many of those listed on the plaques are still with us, alive and well, not ready to be memorialized. There is a "memorial" across the street, on the lawn of the Center Office Building for those killed in combat. What the veterans had was a monument, not a memorial. And, yes, in time those on the plaques will join their comrades at final muster, but new names will continually be added as well. It is truly a "living monument". On Tuesday night there was only one dissenting vote against the restoration of the monument. It was also mentioned that evening that the cost of restoring the monument would be $20,000. Now, that is something I feel may be accurate, but if done right, won't cost the town much at all. Veterans are a resourceful group, with an enormous network of bushiness people, and tradespeople. I can see volunteers donating their time to rebuild the monument. This is only the beginning. Now comes the real work of designing the replacement monument, deciding on a location, and organizing the construction. The focus cannot be diverted, the passion must be just as intense, and I am sure it will be. on Thursday, July 7, 2011 at 6:00 p.m. at the Sturbridge Senior Center, 480 Main Street, Sturbridge, MA. Veterans and interested parties are encouraged to attend. Meeting information submitted by Kathy Neal--ed. The fine folks you see in the above picture, standing where our war veterans' monument once stood, and many more filled Monday's BOS meeting to standing-room only. Some people didn't even make it through the doorway to the upstairs hall. This meeting was a great opportunity to see Sturbridge at its best. There certainly were a few emotional moments, moments that showed real gratefulness, and caring and compassion, relating to the lives our veterans lived in the past, as well as the lives they live today. The veterans and their friends and families stood strong and united as their own veterans' agent accused them of being selfish for wanting the monument put back outdoors where it had been. Selfish? The veterans we know who were at that meeting, the same veterans who risked their lives for our benefit, think of those plaques and our missing monument as belonging to ALL OF US. They understand the value in the real lessons they provide, as a forward-looking way of learning from our past. The appreciation, and the unity we feel were visible when that monument stood in its place of honor on the front lawn of the town hall. Cheers and big thank you go out to the veterans, their families and friends, and, last but not least, to the Board of Selectmen for voting in favor of restoring and reclaiming our veterans monument.